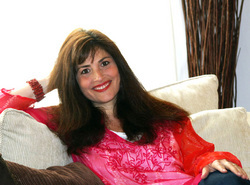 Contact Rosy - Rosy Aronson, Ph.D.
Rosy has remained committed to grounding, freeing and connecting people through the creative process since 1987. She studied Psychology & Social Change at the University of Michigan, in Ann Arbor. Upon receiving her B.A., she moved to Europe, where she trained and worked as a visual artist, breathworker and transpersonal arts therapist. Rosy co-founded the Copenhagen Center for Water Rebirthing, provided creative arts therapy to individuals, couples and families in her Danish private practice, supervised alternative healing practitioners, and led creativity, women’s empowerment and personal growth workshops. Upon returning to the States in 1997, Rosy earned an M.A. at the California Institute for Integral Studies in counseling psychology, with a focus in Expressive Arts Therapy, and then a Ph.D. at the University for Integrative Learning, specializing in Intuitive Listening and the Creative Arts. She became a registered Drama Therapist, with a special passion for improvisation, and for three years, studied the art of "Intuitive Reading" with Phyllis Pay of the Intuitive Energy Center. After writing and illustrating the Prelude to a transformative book series for contemplative kids (ages 8-12) called A Tale of Serendipity: The Adventure Begins!, she immersed herself in the infinitely vast and deeply practical study of Human Design, and now The Gene Keys. Today, along with raising her beloved daughter, Rosy works as a writer, artist and spiritual counselor in Berkeley, CA. She supports and empowers creative souls, blossoming moms, and unconventional livers and learners all over the world, and in a variety of ways. Together with Mireya Alejo, Rosy has co-founded RIE Creative Meditation -- a fun, empowering and permission-giving art/movement-immersion workshop growing in the Bay Area. Because of the practical nature of Human Design and its ability to help her hone in on the unique wisdom of each person, she takes special pleasure in sharing her knowledge of this system with those who feel drawn to it, and to using it as an entry way into deeper forms of collaborative and creative counseling. Rosy is an ordained minister of the congregation Roots and Wings, of AIWP (the Association for the Integration of the Whole Person). Learn more about Rosy's Creative Life Counseling Practice, Visual Art, & Human Design Services! Learn about A Tale of Serendipity! "A Tale Of Serendipity: The Adventure Begins! is embedded in the world of the ocean, and raises the question of how human beings interact with and affect the environment in which we live. It is an incredibly timely tale, given the recent devastation in the Gulf of Mexico, and feels like a call to change that is driven by love and not politics." the fun and inspiring "Moms About to Blossom" E-Zine! Register for the upcoming Fall Support Group or send a private message to Rosy here!